Gentleman Ghost says: Have a happy and safe Halloween! Hawkfans are getting an extra treat this month as tomorrow sees the first issue of Joe Kubert Presents being released by DC. The late comics legend is one of the artists who handed the Winged Wonders in both the Golden and Silver Age, and Hawkman figures into this anthology of Kubert stories. As a fan of Kubert's work on his superhero, war, fantasy, and other properties, to say that I am looking forward to this series is a gross understatement. Newsarama has a preview which you can see right here, and the book should be on the shelf of your Local Comic Shop tomorrow. Image: Page from Joe Kubert Presents #1, 2012, Joe Kubert, image obtained from Newsarama. I am still waiting on my DCBS box, but I did manage to read The Savage Hawkman #13 this weekend. "Hawkman: Wanted" kicks off with a bang, and it's an action packed issue. Besides the not-unexpected throwdown with Shayera, we also get the return of another baddie from earlier in the series which had me cheering. The art continues to look amazing, and Frank Tieri's dialogue works well. Overall, I enjoyed the issue and cannot wait to see what is next. Expect a full review after I receive my comics in the mail. "Sasha Martens grew up as a Military Brat. Her father, Colonel Michael Martens of the U.S. Air Force, came from a long line of military men. When Sasha was a child, she thought she almost died of leukemia and was cured with an experimental drug from the government. When Sasha met Wiley Wolverman at his rock concert for his local band known as the Doves. A riot broke out, Sasha and Wiley escaped the mayhem together. Sasha and Wiley learned they were both part of the same military experiment and searched for answers to their past at a nearby military base. Discovering Dr. Thurber Avian's "Operation Raptor," Sasha learned that civilians were used in these experiments. Sasha and Wiley encountered a bird-man creature while accessing the files, and soon the military police arrived and a scuffle ensued. Sasha and Wiley eluded the police and retreated to Wiley's apartment. Upon awakening, Sasha and Wiley sprouted wings, which they learned to mentally control, manifesting or retracting into their backs. They vowed to track down Dr. Avian as the government began to hunt them as fugitives. Sasha and Wiley were told by Dr. Avian that they called him insane all the while exploiting his research. He claimed that all the others were failures but them, because the Godwave coincided with their developement. But Dr. Avian wasn't fully honest with them, neglecting to mention that he was actually a H'San Natall agent sent to locate the sleeper agent from his Avian Race of the H'San Natall, and furthered their research into human/H'san Natall hybrids. After the Blackest Night Argent followed leads that lead her to Dr. Avian, who she made tell her about the Avian H'San Natall. He told her that Sasha Martens was the actual hybrid and that Wiley Wolverman was enhanced and healed using her DNA. Argent found Sasha and informed her of who she really is which lead Sasha to fly away. Sasha found Dr. Avian and forced him to expose his true self, their battle caught the attention of Golden Eagle who stopped Sasha from taking Dr. Avian's life. Using an orb left on Earth by his father Golden Eagle contacted Thanagar and set up an exchange for Dr. Avian for the lifting of the grounding of his parents. Sasha was lost, everything she ever knew was a lie. Charley Parker held his hand out in friendship, telling her his story. The two spent time together and with Charley's urging Sasha joined the Teen Titans East and decided she wanted nothing to do with the name hawk and took the new name Falcon." 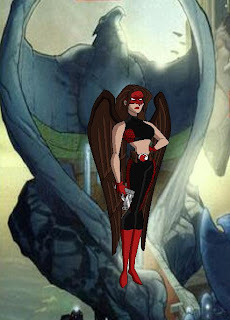 Grafting the Hawk & Dove mythos into the Hawkman mythos is not an idea I can endorse. And doing it with a pair of losers best left forgotten is even worse, as far as I am concerned. The bird motifs are not interchangeable, and the backstory as presented here is so convoluted that I can't imagine anyone caring one lick either way. I liked what Sterling Gates and then Rob Liefeld did with Hawk & Dove in the New 52, and what is teased as continuing to unfold, but this little mash up is best left to the wayside. Visually, Sasha looks alright. I like the use of the handgun which stays true to her time in the comics as Hawk. The criss-cross pattern on the red looks really strange though. I am reminded of the Python Patrol, and as cool as the Python Patrol is, I don't think it is appropriate for someone named Falcon to have a snakeskin pattern on their uniform. Yeesh. The Savage Hawkman #13 -- After all the hype, build up, and Liefeld drama, "Hawkman: Wanted" bows today. Now we get to see if all that has come before has been worth it. 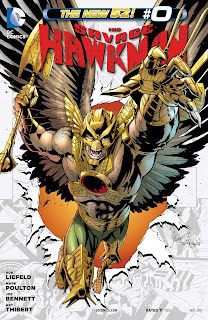 While I don't think this will be the next big thing at DC Comics, it is still encouraging to see a big story featuring Hawkman and Thanagar unfolding not only in the pages of Katar's own book but also crossing over and touching on other titles as well. I think the last time that a Hawkman title crossed over with another one was with JSA when Johns was writing both titles. Plus this story seems like it is going to be a game changer for the Winged Wonder, and hopefully lead to bigger and better things for him in the future. The Savage Hawkman TP v.1: Darkness Rising -- Along with the start of where Hawkman is going, you can also check out where he has come from in this New 52 universe. This volume collects Savage Hawkman 1-8, which is the entirety of the Tony Daniel/Philip Tan run. This includes his tangle with Morphicius, teaming up with Static to battle Gentleman Ghost and his army of zombies, and battling the alien shapeshifter Aksana. We also get introduced to Emma Ziegler, her father, and Carter's neighbor Singh. We may never see most of these characters ever again, and to be honest the book has improved quite a bit from some of these early stories, but those just getting into Hawkman now would be well served to pick this one up. Also, when you head out to your LCS to pick these up, go ahead and grab a copy of Fury Of Firestorm: The Nuclear Man #13 as well. Dan Jurgens has taken over the book and it looks like we are going "back to basics" with Ronnie and Jason. But I'll let Shag tell you about that. Title: "Those Who Rise Above Us"
Summary: On Thanagar, a long period of war has finally ended, with the Thanagarian emperor Thal Provis ushering in a new era of peace. Surrounded by his family, including his son Corsar, his daughter Shayera, and her lover (and Thal's adopted son) Katar Hol, he welcomes representatives from many worlds to Thanagr to celebrate the new peace. Corsar is a haughty warrior, proud of his status, while Katar is more reserved, preaching humility. But despite their differences, the two regard each other as brothers and both serve their father well -- it is under Katar's advice that Thal begins the path to peace. The glory is short-lived, however. One of the empire's new "friends," the Daemonites, secretly unleash a virus called The Plague on Thanagar, and grounding the inhabitants as their wings wither and die. Thal Provis does not survive, and the mantle of leadership is passed to Corsar. The new ruler sees an opportunity, and is advised by the heretical Great Old Ones to recover the legendary Nth Metal. Katar advises against this, but supports his brother. In the Kolarmoran region, a sample of Nth Metal is recovered, but shortly afterwards the entiring mining rig collapses, trapping and killing hundreds of workers. Katar claims the cost is too high, but Corsar and Shayera ask what is a few lives compared to the survival of the entire race? Corsar becomes more and more obsessed with the Nth Metal, and arming his warriors with armor and weapons made of the material. During one argument, the Nth Metal seeks out and bonds to Katar, forming his familiar Hawkman uniform and restoring his wings. Corsar sees this as validation of this course of action, and orders more mining. The mining operations are met with similar setbacks, including a Kolamoran slug eating an entire rig. Corsar, desperate to mine more of the metal, lashes out at Katar, accusing him of treason. Katar defends himself, calling Corsar a tyrant. As the two tussle, Corsar lunges at Katar, who dodges. Corsar's Nth Metal sword impales itself into a computer console, and is electrified, dying instantly. That is the choice moment when Shayera enters the scene, and demands that Katar be arrested for murder. Katar flees with the armor, stealing a Thanagarian vessel and disappearing. Shayera says that she never stopped searching for him, and now that she has found him, she wants to pay him back for the pain he caused her -- with the death of a loved one. Review: First things first, it's quite refreshing to get a cover from someone other than Rob Liefeld again. And Bennett's cover is quite striking, with Carter/Katar coming right at us. Also, it seems that the naming of Katar's former love as "Sheyera" in #12 was a simple mistake, as she is called "Shayera" here throughout. I liked this issue. I thought it was an interesting change on the more traditional alien Hawkman origin as a police officer. Here, he Katar is a man of peace and tolerance, a far cry from his "smash first, ask questions later" approach both before Flashpoint and here in the New 52. But by divorcing itself from the previous Thanagrian origins, it does an admirable job of trying to cover new ground rather than rehashing the past. The change does raise a lot of questions for me, including the obvious one of "just how the heck did he make it to this point psychologically?" Of course, there are some other issues as well -- what the heck happened to his Thanagarian ship, for one. Does he have it hidden away somewhere like in Volume 4? Or perhaps it is sitting in geosynchronous orbit like the Silver Age? Some oddities: Is Thal Provis (and Corsar, for that matter) a King, or an Emperor? I guess both? The titles are used seemingly interchangeably throughout. Also, are all Thanagarians born with wings? Traditionally, Thanagarians typically looked human, and wore artificial wings, save for the Downsiders anyway. The presence of organic wings reminds me of the Justice League cartoon. The art from Bennett, Thibert, and Major is top notch once again. The trio really get to flex their muscles this time out, with alien species and environments on display. There is one panel flashing back to the war which shows the heavily armored Thanagrian troops with their angelic white wings which looks simply fantastic. Shayera is still blonde this time out. I am neither totally sold on nor totally opposed to; the only thing I will say is that with her haircut and the color of her tresses, she reminds me of Cassie Sandsmark, facially. Which is really neither here nor there, but there you go. The dialogue is a little on the grandiose side, but as this is a flashback to the royal family of a race of winged, imperialistic aliens, I am willing to let that slide. The plot was straightforward but sensible. 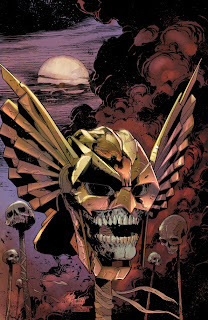 I also really liked the continues fleshing out of the alien races of the New 52 DCU -- with the Daemonites playing a big role in the downfall of Thanagar. I imagine that Katar will be playing a good sized part in the inevitable showdown between Superman and Helspont in the coming months and years. I did like how the dialogue showcases Shayera's mixed emotions: in the one sense she agrees with her brother about the greatness of Thanagar and the cost of restoring that greatness, but on the other hand she also counsels Katar about Corsar's motives and what Katar perceives as arrogance. Then her fury at the end, which is not a good sign for Katar in the next issue! Overall, this was a very strong issue which I think did a good job of telling the origin of our new Katar Hol/Carter Hall and setting the stage for "Hawkman: Wanted." The few niggling complaints I had didn't take me enough out of the story to spoil it, so I am pleased with this issue. Note: As you can see on the Generations, this is the New 52 Katar Hol and Carter Hall. 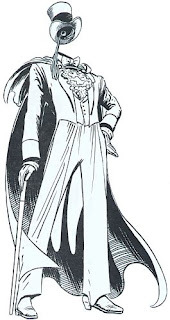 In keeping with the way which I handle the Silver Age books, going forward our hero will be tagged as "New 52 Katar" until or unless there is some reason that "New 52 Carter" makes more sense. At least, that is my thoughts; what do you folks think? Image: The Savage Hawkman #0, 2012, Joe Bennett. It's the fourth week of the month, which means that it's time to get Savage! The Savage Hawkman #13 is out this Wednesday, October 24, and "Hawkman: Wanted" is going to get started! Multiversity Comics has a preview which you can check out right here. My my does Sheyera look like the proverbial woman scorned on that cover! The preview also confirms that Rob Liefeld is credited with the plot and Frank Tieri is credited with the dialogue. Does this suggest that Liefeld was doing plots and Mark Poulton was doing scripts back during their collaborative efforts? Does it really matter at this point? I'm not so interested in the past as I am in the future, and this story looks hot. I, for one, cannot wait to get my hands on this. The set up for it in #0 (yeah... review coming soon...) coupled with some of the hype we have gotten for it has this one shaping up to be a really special Hawk event. What do you folks think? Are you excited for "Hawkman: Wanted?" Or burned out on all the drama? Thanks to Matt Orr (follow @Hawkmanfans) for the tip! Image: The Savage Hawkman #13, 2012, Joe Bennett. "Sharon Parker lived a pretty normal life until she met Carter Hall Jr, who at the time she didn't know was really a secret agent from Thanagar named Fel Andar. Sharon didn't know until Fel Andar was called back home, but she went with him knowing she loved him and would give up everything to be with him. Leaving their son with family planning on returning, not knowing that Fel Andar was sentenced to never leave the Planet Thanagar again." I like her colors though, despite the potential Christmas connotation from the mixture of green and red. Be sure to check out the other Families posts! Image: Sharon Parker, 2010, NightwingTAS, Image Retrieved from Super Buddies. DC's Justice League family solicitations are up over on Newsarama for the month of January, so that means the new solicit for The Savage Hawkman and Earth 2! • "HAWKMAN: WANTED" crashed to its conclusion! • Carter Hall can't escape his past! • Two worlds collide — with Hawkman caught in the middle! Looks like it is indeed Frank Tieri after all who will be picking up the reins from Rob Liefeld. I am perfectly fine with this turn of events given my past enjoyment of Tieri's work on characters such as Iron Man and Hercules. The art team is, for now, the same. I personally am hoping for this crew to stay on for the foreseeable future, but who knows with the way that art teams shift around at DC these days. I also want to mention that the cover itself is beautiful. So nice to get a non-Liefeld cover once more. The solicitation text itself is pretty coy, but from the bit about Carter not being able to escape his past, that suggests to me that his past will become a known entity. Between this story and what is going down with Hellspont over in Superman (including the Annual), it seems that Carter's alien origins may not be a secret for very much longer. • The alien war criminal Steppenwolf returns! It's been five years since he lead the forces of Apokolips against Earth — learn what he's been up to since then! • Plus: What is the dark secret behind the last Amazon of Earth 2? Okay, all I have to say is that Yildiray Cinar and Art Thibert look like one hell of a team. I had said that I would love to see Cinar on a Fantasy or S&S title ever since first seeing his work on Firestorm, and this cover -- with who I am assuming is Mars (Earth 2 using the Roman gods) and the "last Amazon" -- looks like it would be just as much at home in the pages of Sword of Sorcery. Fantastic (no pun intended). Who is the "last Amazon?" Donna Troy, perhaps? Artemis? Someone new? I have no clue. Robinson's world building so far with this title have been really quite impressive so I am very much looking forward to seeing what he has in mind for this new Amazon. No information in this bath of solicits on potential "Fourth Wave" books, although I suspect that DC may be holding this until the end when they reveal the full solicitations. At the very least there should be a replacement for GI Combat, which was solicited with "FINAL ISSUE" last month. So what do you folks think? Do these sound like books worth reading to you? Or will you pass? Image: The Savage Hawkman #16, 2012, Joe Bennett. I have been very lax at the wheel of the blog lately, with October being a dead-run between work, family, and other professional obligations. But I did want to share this super insightful comment from Geoff Johns, noted Hawkman scribe who will be handling the character in the upcoming Justice League of America title some time next year. Johns promises "a lot of big Green Arrow stuff coming up," not just in JLA.Stargirl is the "only one who's really excited to be there," Hawkman "just shows up, beats someone up, then disappears and no one knows where he goes." Well, that certainly sounds like a deep and meaningful character arc for Carter, doesn't it? Show up, beat people up, and wing off. Sounds like he should be wearing that old "Stone Cold" Steve Austin shirt, which read "Arrive. Raise Hell. Leave." I'm sure Johns has something good in mind for Hawkman, as he does seem to be one of his favorites. So I assume that this tease is meant entirely in that vein: as a tease. Johns further described this new JLA as "the most dangerous superheroes in the world," which sounds somewhat ominous. Justice League of America is starting sometime in the new year. It is assumed it will be part of the "Fourth Wave" of the New 52 along with the newly announced Snyder/Lee Superman title (which I am assuming is going to be titled Man Of Steel or some variant thereof) and most likely a few other books. What do you folks think? Do you like Hawkman as the brute force muscle of the new JLA? Is this more of a swerve from Johns? Leave a comment and let's discuss! Summary: In Rome, as Hawkman and Emma regroup following the battle with St. Bastion, the Winged Wonder is shot in the shoulder by a high powered rifle, and then tackled by the mercenary known as Pike. 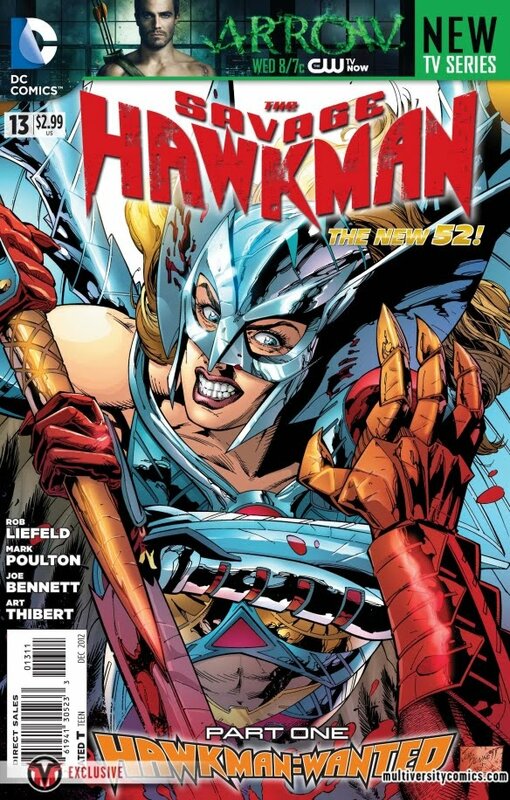 Pike claims responsibility for the bombing of Carter's apartment back in New York, and lays into Hawkman. The two combatants tangle back and forth, trading blows, as Hawkman tries to use his ability to fly to his advantage. Pike is ready for it, however, as he has an alien-tech flying motorcycle at his disposal. Taunting his foe incessantly, Pike puts up a good fight, but Hawkman eventually out-manuvers him and is able to take down the operative, and demands that he tell him about who hired him. 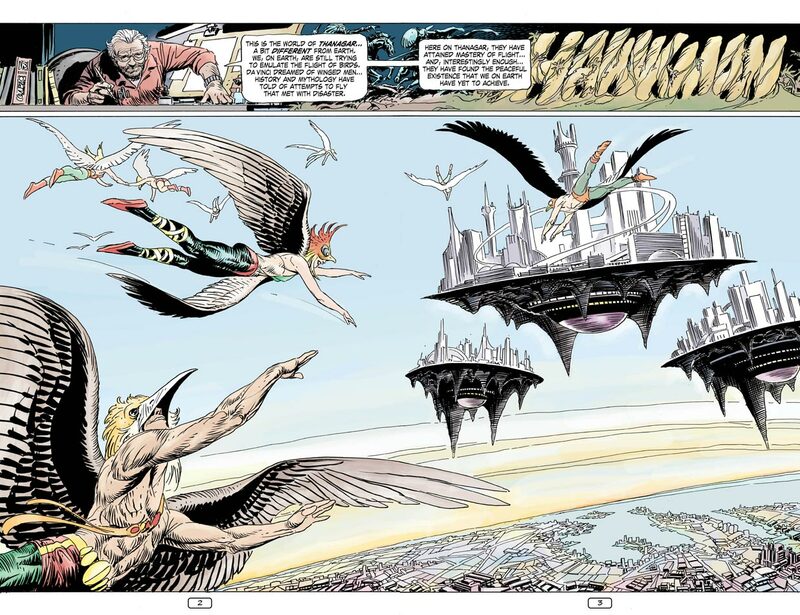 At Pike's cloaked ship, Hawkman and Emma restrain the mercenary, who claims to be the offspring of an alien known as a Kherubim and a human woman. Pike is defiant to the last, claiming that they won't hurt him because he is the only lead that they have for who is hunting down Hawkman. Pike tells them about the Daemonites, led by the cruel Hellspont, and how Thanagar is at war with them -- and it's all Carter's fault. Hawkman is not sure what exactly that means, but the name stirs a memory. Pike is smarter than he looks, however, and uses the ships automated defenses to gas Hawkman and Emma and capture them. Shortly after, Hawkman awakes to see Pike preparing for the arrival of his benefactor. Saying that it's good that Hawkman is awake for this, a huge Thanagarian warship lands nearby, and Pike presents his prisoner to the person who hired him: Princess Sheyera of Thanagar. Carter's memories snap back, and he remembers Sheyera, the woman he loved, who now wants nothing more than to kill him! 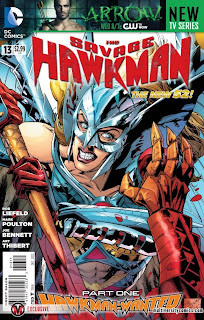 Review: Another issue of Savage Hawkman, another tightly assembled superhero comic book. It's a shame that Rob Liefeld and DC had their falling out because Rob seems very well suited to writing this book. It's straightforward and unabashedly an action comic, and for this character, in this story, that's a great fit. And I can't say anything more about Joe Bennett's lovely art, other than to add that his alien designs, including Pike's "hog," and Sheyera's warship, are just as nicely handled as his people. Pike is sort of a less-annoying version of Deadpool. He seems to be able to read Carter's thought baloons; at one point in their fight, Carter has several caption boxes about his situation, which Pike seemingly responds to, asking "What is this, a young adult romance novel?" And at the very end, when Carter's caption boxes detail his once lovey but now dangerous relationship with Sheyera, Pike interjects with an amusingly off-panel "Awkward" to end the issue. He's a fun character as a foil, but couldn't they at least colored him a different set of colors than black and red? His origins are interesting (Kherubim/human half breed) and his belief in destiny is an interesting angle for a soldier of fortune. I wonder if we will see more of him going forward now that Rob is not on the book? The twist at the end is nicely done. "Sheyera," as she is named here, is blonde, which is odd because she really looked like she had red hair back in issue #9. The expansion of the cosmos to include both Thanagar and the Daemonites is welcome, especilly given some of the revelations about Carter we will get in the next issue. Overall I liked this one. It had a nice mix of action, backstory, and cliffhanger, and Pike's snide commentary made me laugh. Really can't wait to see what's next. 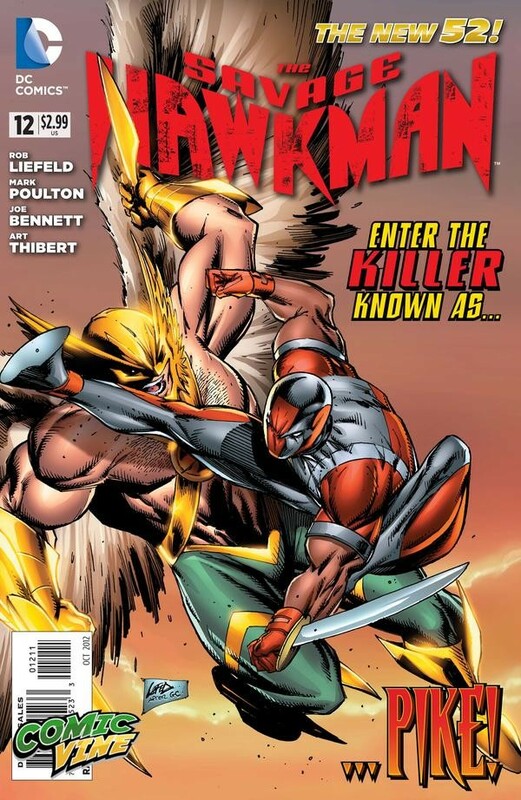 Image: The Savage Hawkman #12, 2012, Rob Liefeld. "Fel Andar was born on and raised on Thanagar as a part of the planet's defense against the H'San Ntall, as a Human/Thanagarian hybrid. Fel was sent to Earth where he assumed the name Carter Hall Jr, the son of the original Hawkman and Hawkgirl. While on Earth Fel Andar fell in love with a human woman named Sharon Parker, and the two were married. Shortly after they debuted as the third Hawkman and Hawkgirl. The two had a child, Charley, which they kept to themselves. When Charley was 4, Fel Andar was called into duty when the H'San Ntall abducted 9 Earth woman. Fel had to return to Thanagar, to answer for how the H'San Ntall had been able to achieve this goal. Not wanting to let him go Sharon wanted to join him, but Fel feared his son growing up on Thanagar and being trained as a property of the government to be used as he had been. Sharon agreed, and they left him in care of family, who they didn't know had shipped him to an orphanage shortly after." The inclusion of Fel Andar makes sense, considering that Golden Eagle was included previously. If you have the son, figures to have the father, right? But the problems of a character like Fel Andar come to the forefront when you lay it all out in the open and examine it. He's Thanagarian guy who pretends to be the son of two humans and becomes a superhero and marries a human girl who becames his superhero partner, and so on? It gets a bit convoluted as we go, yes? But that's his deal, I suppose. I think there is a story to tell with him, but I think in a setting like this, he would require some changes. Maybe have him move in as the "new" Hawkman while Carter and Shiera were off-planet? Or something like that, I'm sort of shooting from the hip. It's hard with a character like Fel Andar, a retroactive inclusion, to make sense of it in a streamlined sense for a TV series. Maybe he would only appear in flashbacks in episodes focused on Golden Eagle? Maybe? Changing the color of the straps and adding the gauntlets is not really all that creative from a visual standpoint. If I was going to include Fel Andar in a Hawkman-centric animated series, I would have changed his look somewhat, more akin to how Hawkman looked in the later pages of Volume 3, with the blue uniform. I think that would work, and it would visually differentiate the two Hawkmen more. Check out the other Families Posts today as well! Image: Fel Andar, 2010, NightwingTAS, Image Retrieved from Super Buddies. It's time once again for another installment of the Hawkman Families! In this series, web artist NightwingTAS has created a series of Bruce Timm/Paul Dini styled characters for use in theoretical DCU animated series. And this being the blog that it is, we are looking at the fantasy series Hawkworld! "Charley Parker never knew who he was until he died. When one of the Wildebeast Society killed him Charley had a near death experience where he seen the truth of his life before the Nth Metal snapped him back to life. Charley is the son of Fel Andar and Sharon Parker, the two of them were known to the world as Carter Hall Jr and Sharon Hall, and better known as Hawkman and Hawkgirl." As far as a design, though, I can get behind this one. The Honor Wing-less helmet makes sense for a young man still getting started on his heroic journey. I also like the big spikey axe-thing, which looks like it would fit in nicely on the pages of Savage Hawkman, ironically. The different chest symbol is a good touch -- clearly Charley is part of the Hawk legacy, but his own man as well. I still think that having the character of Golden Eagle can work as part of a streamlined Hawk story engine, but I question whether a Golden Eagle with this origin can really work. What do you folks think? Does Golden Eagle fit in with this sort of series? Be sure to click through below and check out the other Families Posts today! Image: Golden Eagle, 2010, NightwingTAS, Image Retrieved from Super Buddies.